Shocking new evidence has emerged of GCHQ's attempts to avoid independent scrutiny of its deeply intrusive surveillance activities. Once again, it has embarrassed itself publicly in trying to avoid public embarrassment, writes Privacy International's Millie Graham Wood. In today’s latest hearing in our ongoing legal challenge against the collection of massive troves of our personal data by the UK intelligence agencies, shocking new evidence has emerged about GCHQ’s attempts to yet again avoid proper independent scrutiny for its deeply intrusive surveillance activities. In a truly breathtaking exchange of letters between the Investigatory Powers Commissioner’s Office (“IPCO”) and the Director of Legal Affairs at GCHQ, it has emerged that GCHQ have attempted to undermine legal proceedings against them, as well as the independence of the very body that is tasked with seeing that our intelligence agencies operate lawfully, by suggesting that the government and IPCO should work together to decide together what evidence is submitted during legal proceedings. 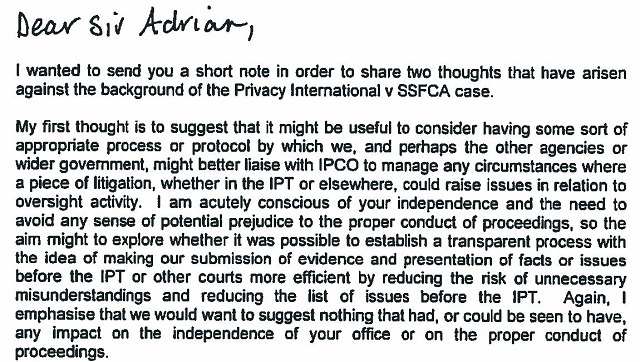 In the letter from GCHQ to Sir Adrian, dated 8 November 2017, GCHQ proposed a process whereby not only the intelligence agencies but also “wider government” can influence the evidence provided by IPCO to the courts, on issues that are actively being considered in legal proceedings. They refer to this as the ability to “manage any circumstances” which relate to oversight activities. The procedure would enable the agencies and wider government to make “our submission of evidence and presentation of facts or issues” to avoid “misunderstandings” and reduce the issues before the Tribunal. GCHQ made a second proposition, also rejected, in which they wished to “explore whether in the current cases there may be any appropriate options for resolving any factual issues which may exist in relation to evidence currently before the IPT”, again outside the legal proceedings. The desire of GCHQ to do this should be seen in the context of the IPCO’s recent revelations to the Investigatory Powers Tribunal in Privacy International’s challenge to the intelligence agencies’ collection, retention and use of ‘bulk personal datasets’ and ‘bulk communications data’. At the last hearing, the IPCO revealed for the first time that GCHQ collects bulk personal datasets of our social media data, and confirmed the lack of technical oversight of the intelligence agencies. It is extraordinary that GCHQ has written to its independent regulator to ask if it and ‘wider Government’ can work together, essentially to head off legal claims. It is a blatant attempt to bury embarrassing evidence and claims against them. They seem to want to avoid the kind of extraordinary disclosures that we had at the last hearing, such as the revelations that the intelligence agencies are collecting massive amounts of information, including from our social media accounts. GCHQ is in effect suggesting to the IPCO, ‘can we agree your evidence before you give it to the Tribunal, so we avoid anything we don’t like?’. 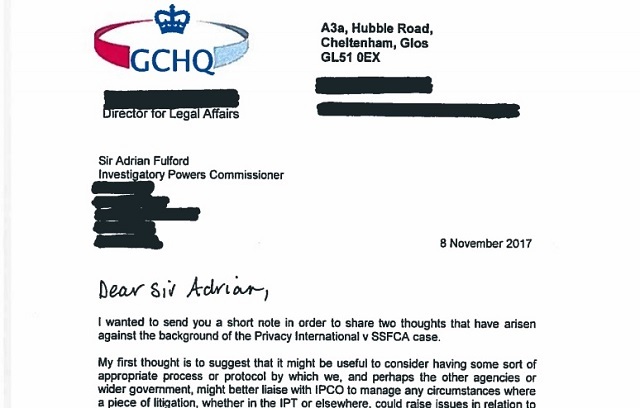 IPCO rightly pushed back against GCHQ’s brazen proposals. Whether the government knew about GCHQ’s indecent proposal to its independent regulator is a mystery. In short, GCHQ has embarrassed itself publicly in trying to avoid public embarrassment. If GCHQ believes these are acceptable propositions to make to its new independent regulator, one can only wonder, what did they do under the previous regulatory regime? We are pleased to see the new Commissioner doing his job by expressing in clear terms that his role is to provide a wholly independent assessment of the material before the IPT. Long may it last. For more info on Privacy international’s campaign against , visit the Privacy International website. « Previous: Comment | How many more Yemenis must die before Theresa May stops putting profits before lives?